Seeing as it's getting on mid-March, figured I'd better be thinking about my March 2014 plans for the 'Make a Garment a Month Challenge'. 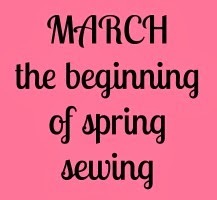 Sarah Liz has given us monthly theme ideas, and this month she suggests sewing for Spring. ...but she's right, it's best to think ahead because Spring will be here but for a bit, and then it'll be the hot, humid Southern Summertime. So, taking all that into consideration, I'm planning to sew Simplicity 2188 view D, a pair of cropped pants with a piece of linen blend fabric I bought last year and already prepped like my linen leopard print, so this will be easy care wash-n-wear. I'm thinking to include the cute gathered strings on the sides too. In my fabric stash are a couple of pieces of fabric that will coordinate well with this dark-olivey linen to make into coordinating tops. I'm keeping this month's plans simple in the hopes that I'll accomplish a little more than 'planned'. Kind of like 'backward psychology'?! I'd also like to say I am very much enjoying participating with such a nice supportive, encouraging group of ladies. This is a nice 'challenge' to be a part of. COMPLETION UPDATE: Changed the fabric and the pattern to create the oh-so-cute cropped cargo pants in the photo below. Modified NEWLOOK 6216. Read more here . As quickly as the weather changes, you'll be able to wear those cute pants within a couple weeks of finishing them! They are sure to be something you'll reach for often. catching up on older posts...your top from your 90's fabric was just perfect , I thought. And when it comes to curves, you are doing just great...so,go ahead and feel fine about wearing it!! You are so kind Kathy! Thank you!